For other people named Thomas Gibson, see Thomas Gibson (disambiguation). Thomas Ellis Gibson (born July 3, 1962) is an American actor and director. He portrayed Daniel Nyland in the CBS television series Chicago Hope, Greg Montgomery in the ABC television series Dharma & Greg and Aaron Hotchner in the CBS television series Criminal Minds (2005–2016). Gibson was born in Charleston, South Carolina, to Charles M. "Mac" and Beth Gibson. His mother was a social worker, and his father was a lawyer and liberal Democrat who served in the South Carolina state Senate and House. He is Roman Catholic. Gibson's interest in the performing arts began at a young age. Gibson was fascinated with Louis Armstrong. He and his sister were on a swim team together and they frequented a pizza parlor after their swim meets. It was at this pizza parlor that Gibson would sing along with a Dixieland band, complete with his attempt at a Louis Armstrong voice. As a child, Gibson enrolled in Little Theater School and later graduated from Bishop England High School. He then attended the College of Charleston (1979–1981) and became an intern at the Alabama Shakespeare Festival, where he was encouraged to apply to the prestigious Juilliard School. After a year and a half at Charleston, Gibson won a scholarship to Juilliard's Drama Division (Group 14: 1981–1985), where he graduated with a Bachelor of Fine Arts degree in 1985. Gibson started acting when nine years of age in children's theater. He appeared in Julian Wiles' Seize the Street: the Skateboard Musical, a Young Charleston Theater Company (now Charleston Stage) production. As a teenager, he began his classical theater training by becoming a member of the Young Charleston Theater Company and the Footlight Players, often performing at the historic Dock Street Theatre. During his time at College of Charleston, Gibson was an intern at the Alabama Shakespeare Festival. Gibson made his stage debut in David Hare's A Map of the World in the New York Shakespeare Festival. He subsequently appeared in more plays for producer Joe Papp, both in Public Theater and in Central Park. He worked on and off Broadway for the next ten years in a diverse range of plays by Shakespeare, Christopher Marlowe, Molière, Tennessee Williams, Howard Brenton, Romulus Linney, Noël Coward, Alan Ball and many others before turning to the small screen. Gibson also waited tables at Tavern on the Green. Gibson's first television appearance was in 1987 in a guest role on CBS' legal drama Leg Work, followed by stints on the daytime dramas As the World Turns (CBS) and Another World (NBC). In 1992, Gibson made his big screen debut in Ron Howard's Far and Away, in which he portrayed Stephen Chase. Chase was the villainous rival of Joseph Donnelly (Tom Cruise) for Shannon Christie's (Nicole Kidman) affections. His next lead role was in 1993 as David, a gay waiter, in Denys Arcand's Love and Human Remains. Gibson later reunited with Arcand in Stardom (2000). Also in 1993, he played the slimy misanthrope Beauchamp Day in the Tales of the City miniseries (1993). Gibson then returned to television when portraying Dr. Danny Nyland in the CBS medical drama Chicago Hope from 1994 to 1998, starring alongside future Criminal Minds costar Mandy Patinkin. From 1997 to 2002, Gibson portrayed Greg Montgomery in the ABC sitcom Dharma & Greg, for which he was twice nominated for a Golden Globe Award. After Dharma & Greg, Gibson appeared in various TV movies. In 2005, he was cast in the role as Supervisory Special Agent Aaron "Hotch" Hotchner, the Unit Chief of the Behavioral Analysis Unit (BAU) team, in the CBS series Criminal Minds. On August 11, 2016, Gibson was suspended after appearing in two episodes of the twelfth season of Criminal Minds, following an on-set altercation with a writer-producer; he apologized for the confrontation in a statement, claiming the dispute arose from creative differences in an episode he was directing (Gibson had previously directed six episodes of Criminal Minds since 2013, along with two last season episodes of Dharma & Greg in 2001). Gibson had a prior altercation with an assistant director and underwent anger-management counseling. The following day, ABC Studios and CBS Television Studios (which co-distribute Criminal Minds) issued a statement announcing that Gibson's contract with the series had been terminated. 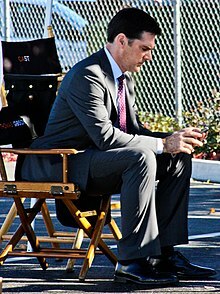 The statement included the information that the exit storyline of the Aaron Hotchner character from the series had yet to be determined. In the October 12, 2016, episode, "Taboo", the absence of Gibson's character is explained as being away on special assignment; however, in the episode "Elliot's Pond", it is revealed that he resigned and went into the Witness Protection Program after noticing a serial killer stalking his son. Gibson and his former wife Christine have three children: James Parker, Travis Carter and Agatha Marie. They reside in San Antonio, Texas. Travis Carter was featured in the season 10 episode "Boxed In" (#5) of Criminal Minds as a friend of the Kidnapped Kid in that episode. Gibson and his wife separated in 2011 and in 2014 he filed for divorce. The divorce was finalized on 14 February 2018. Gibson enjoys golf. He plays at the AT&T Pebble Beach National Pro-Am every year, as well as other golfing events, and is friends with golfer Corey Pavin. He served as part of the 2010 Host Committee for the Inaugural SAG Foundation Golf Classic, and co-hosted the 2nd Annual SAG Foundation Golf Classic with Criminal Minds castmate Joe Mantegna. 1987 Leg Work Robbie Episode: "All This and a Gold Card Too"
Caroline in the City Willard Stevens Episode: "Caroline and the Nice Jewish Boy"
Sin City Spectacular Episode: "1.6"
A Will of their Own James Maclaren Episode: "1.1"
2011 Two and a Half Men Greg Episode: "Nice to Meet You, Walden Schmidt"
2015 Hot In Cleveland Tom Episodes: "Vegas Baby", "I Hate Goodbyes"
^ a b "Thomas Gibson Reveals Why He Kept His Divorce from Wife of 20 Years a Secret and Reveals How They Are Co-Parenting". People.com. Retrieved October 1, 2016. ^ "Thomas Gibson". Newsbank.com. Retrieved October 15, 2013. ^ Rizzo, Frank. "Actor Craves Respect More Than Fame". Courant.com. Retrieved October 15, 2013. ^ "Up Swing". People. Retrieved October 15, 2013. ^ "Thomas gibson interview from 2000". criminalmindsfanatic.blogspot.ca. Retrieved October 15, 2013. ^ a b "Bonnie Hunt Interview" (Video). Youtube.com. ^ "Thomas Gibson". All Movie Guide. The New York Times. Retrieved April 4, 2012. ^ "Thomas Gibson". imdb.com. Retrieved August 12, 2016. ^ CNN, Sandra Gonzalez. "Thomas Gibson suspended from 'Criminal Minds' after on-set altercation". cnn.com. Retrieved August 12, 2016. ^ "Thomas Gibson fired from 'Criminal Minds'". ew.com. Retrieved August 12, 2016. ^ Donahue, Steve (April 30, 2012). "My Town: Thomas Gibson's Charleston". Golf Digest. Condé Nast. Retrieved June 26, 2013. ^ By Evan Real (August 22, 2016). "Thomas Gibson Secretly Filed for Divorce Two Years Ago - Us Weekly". Usmagazine.com. Retrieved October 1, 2016. ^ "Vegas Baby/I Hate Goodbyes". June 3, 2015. Retrieved August 12, 2016 – via IMDb. ^ "Episode #6.24". January 1, 2000. Retrieved August 12, 2016 – via IMDb. ^ "Under-Appreciated Entertainer of the Year 2010". PopWatch. EW.com. December 3, 2010.